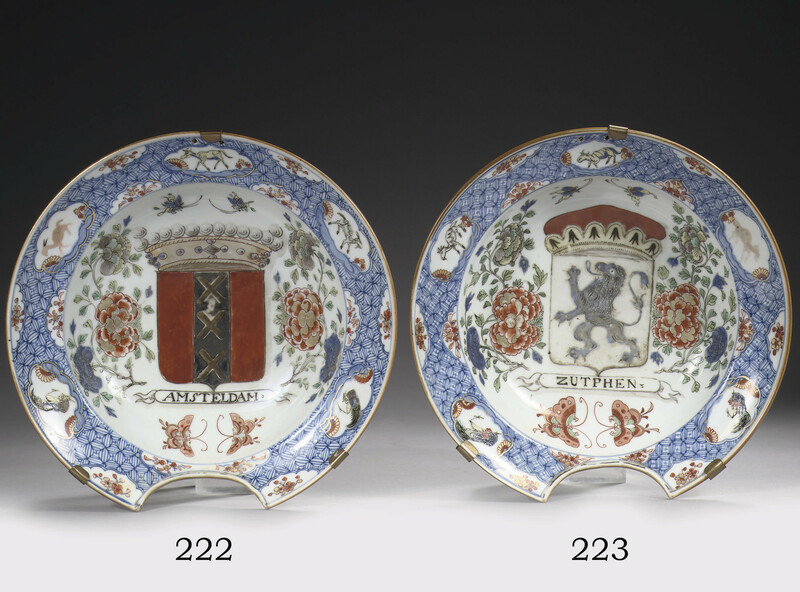 At least five series of dishes, plates and barber's basins were made in the 1720's depicting the arms of Holland, England, France, Luxembourg, and numerous Dutch and Flemish provinces and cities. Twenty-three different arms appear to be recorded, although there is no documentary evidence to prove that each series comprised quite as many different examples, and judging by the spelling of the names, it is likely they were made to Dutch order. For a discussion on these series, see C. Le Corbeiller, China Trade Porcelain: Patterns of Exchange, New York, 1974, pp. 38 and 39, where the author explains that the grouping of this series suggests the borders of this region after the 1713 Treaty of Utrecht which ended the War of the Spanish Succession. In 1717 Triple Alliance marked the new rapport of England, France and the Netherlands, and Le Corbeiller posits that the dishes may have commemorated this development. Dr. C.J.A. Jörg notes that it is unclear why certain arms appear again and again, while other quite major centers like Haarlem and Leiden are not represented at all. One of the series is decorated in the famille verte palette, two in the verte-Imari palette, one in rose-verte, and very rarely one in the rose-Imari palette, although the last would appear to be primarily barber's bowls. The shapes vary from small moulded dishes to large chargers of circa 47 cm. diam. and to barber's bowls like the present lot. Fewer shaving bowls than dishes seem to have been manufactured in the series of 'Provinces' dishes. Lady Charlotte Schreiber records in her journal acquiring one with the arms of Groningen in 1879, See Le Corbeiller, China Trade Porcelain: Patterns of Exchange, New York, 1974, p. 39. Two shaving bowls with the arms of Frankrijk and England were sold in these rooms in the 'Anton Philips' sale on 6 November 2007, lots 362 and 363.